I hope you all had a fantastic Black Friday! I did some shopping myself in stores and online, and found some amazing deals! I have to admit I’m a little sad the deals are all over, but I have some good news for you! Almost everything I’m wearing is ON SALE!!! Did I mention how much I love this outfit? The leopard blouse and the detailing in the back, my booties with lace up back? How cute are they? Oh, and the denim I’m wearing? Don’t even get me started, I love the distressed detailing and the fit is perfection. Here’s a list of the sales from this outfit! Pink Blush is extending their Black Friday deal and having a 40% off the entire site today and tomorrow. Use code BLACKFRIDAY40 at checkout. Oh my! I need this outfit! It is so flawless and just screams my name! 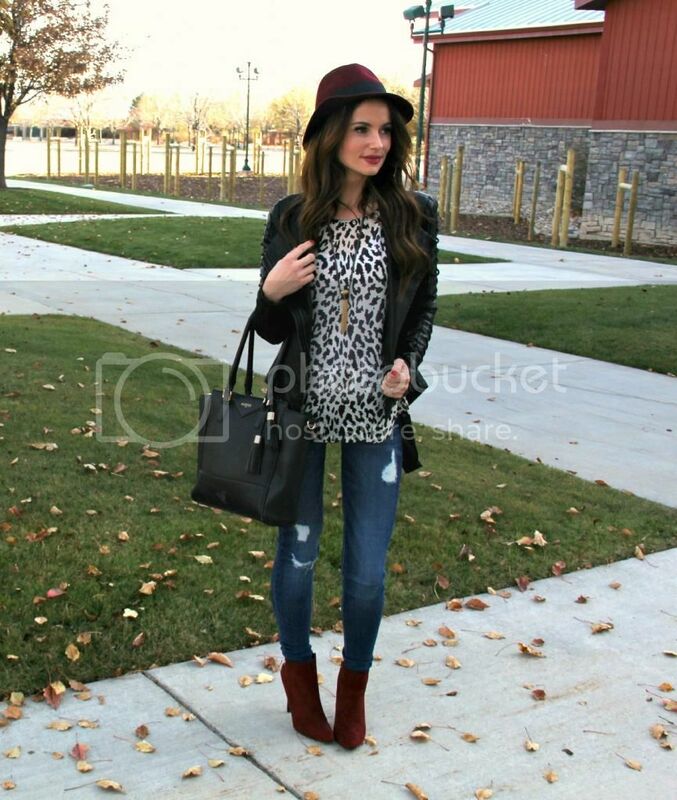 Loving the leopard with that jacket and of course those shoes are drool worthy! That outfit is so great! I love the color of your booties! What a great outfit! I love the black leather jacket, and the colour of those boots is perfect. Really fun leopard print top too. Can't believe this is all on sale! I love the look! The boots and hat are such an amazing color. The touch of leopard is the perfect touch. Such great look! LOVE the booties.